Long Beach, CA, May 4, 2017 – The Advanced Clean Transportation (ACT) EXPO, taking place this week in Long Beach, CA, was the venue for the recent preview by Kenworth of CalPortland’s first clean Compressed Natural Gas (CNG) mixer. The all-white Kenworth T880S with the ISL G Near Zero emissions engine was proudly displayed through the collaboration of Kenworth, McNeilus, Clean Energy Fuels and CalPortland in the Kenworth booth at the EXPO. The CalPortland mixer is Kenworth’s pilot truck equipped with the Cummins Westport ISL G Near Zero emissions engine. The T880S, equipped with the 8.9-liter Cummins Westport ISL G Near Zero emissions engine, can operate on 100 percent natural gas, which can be carried on the vehicle as either compressed natural gas (CNG) or liquefied natural gas (LNG) form. The new ISL G Near Zero is also compatible with renewable natural gas (RNG) which allows for even further reductions in GHG emissions. McNeilus® partnered with Kenworth to provide its 10-1/2 yard Bridgemaster® Transit mixer body and the company’s NGEN™ twin vertical compressed natural gas (CNG) system – which offers customers an enhanced high capacity, low profile back-of-cab configuration – for the T880S mixer displayed in the Kenworth ACT Expo booth. CalPortland’s “clean fleet” will operate on RedeemTM by Clean Energy renewable natural gas fuel made entirely from organic waste. Redeem is the first commercially available, renewable natural gas vehicle fuel. It is derived entirely from organic waste streams and is available in either CNG or LNG form. Clean Energy Fuels indicates that according to the California Air Resources Board (CARB) estimates, Redeem enables up to a 70% reduction in carbon emissions when displacing diesel or gasoline fuels. The fuel is derived from biogenic methane that is naturally generated by the decomposition of organic waste at landfills and agricultural waste sources. Capture and combustion of this methane, which might otherwise have migrated to atmosphere, can result in a negative carbon footprint. 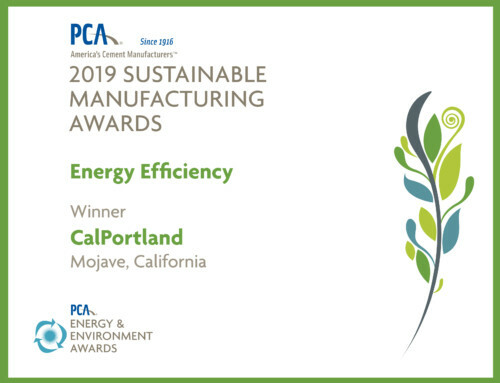 The U.S. Environmental Protection Agency (EPA) recently presented the 2017 ENERGY STAR® Partner of the Year – Sustained Excellence Award to CalPortland for its continued leadership in protecting our environment through superior energy efficiency achievements. This is the thirteenth consecutive recognition by U.S. EPA ENERGY STAR for CalPortland, a feat that has never been matched by any other U.S. building materials manufacturing company. CalPortland continues to identify opportunities to expand the use of alternative clean fuels as well as optimize energy efficiency through its Energy Management program.